This Kichler Brinley single wall light in olde bronze finish with clear glass shade boasts vintage industrial style. Featuring a circular wall mount, two mounting brackets and over-arching arm, with detailed strap gallery, inverted clear glass jar shade and exposed lamp bulb. A superb quality wall mounted light fitting, with circular wall bracket, angled supports and over-arching arm. A glass jar shade hangs from an old bronze metal strap, with the bare light bulb visible within. The vintage style of this collection gives a beautifully modern treatment to the familiar and comfort of storage jars. Used in groups or stand-alone, the Brinley suite is a new touch of home in old bronze. Shown here with a vintage squirrel cage lamp that can be purchased separately by following this link. The perfect companion in any rustic environment and ideal for installation in an industrial style kitchen, trendy hallway, living or dining room. 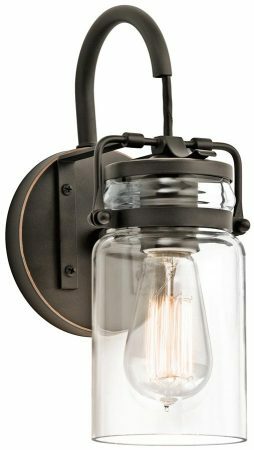 This industrial style light is supplied by Elstead Lighting and designed in the USA by Kichler who were founded in 1938. They design beautiful home lighting products featuring award-winning craftsmanship and unparalleled quality, such as the Brinley single wall light in olde bronze finish with clear glass shade you see here.